What happened to the Add-ins? Are they discontinued? Or have Microsoft screwed up the installation? Not at all! The add-ins are still available as before. So what’s going on here? Well, this is because NAV 2015 automatically deploys the add-ins when needed. Hurray! Yippee! Add-ins are installed in the add-ins folder of the Dynamics NAV server and copied to the client on demand. You can extend the Microsoft Dynamics NAV server and the Windows Client with functionality that is available in Microsoft .Net Framework assemblies. The C/AL code can directly interact with .Net Framework objects, either from the .Net Framework class library or from your own custom assemblies. These assemblies can be used server side or client side. 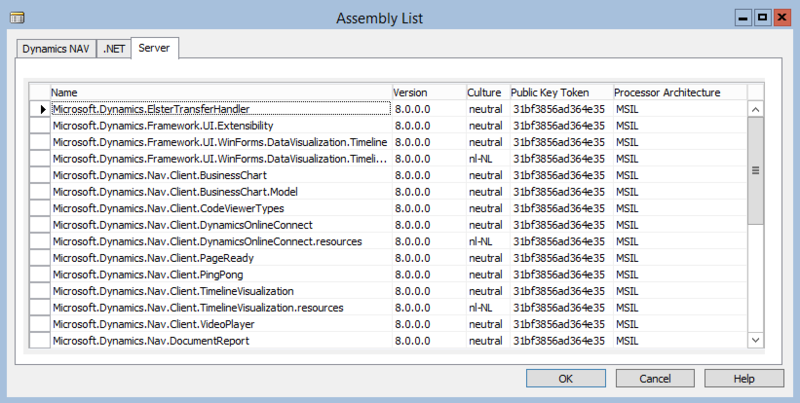 When using client side assemblies, they must be in the .Net Framework Global Assembly Cache or in the Add-ins folder. Normally the custom assemblies are installed in the Add-ins folder of the Windows Client. The challenge with client-side assemblies was how to deploy them with as little disruption as possible to the user. The CfMD software test requires an installer for the client side assemblies, but many partners were struggling with the approach of an installer that user must run on their local computer before they could use their software. Some time ago, I published an example about how to automatically deploy assemblies, but still got many questions from people. So that approach wasn’t that easy either. 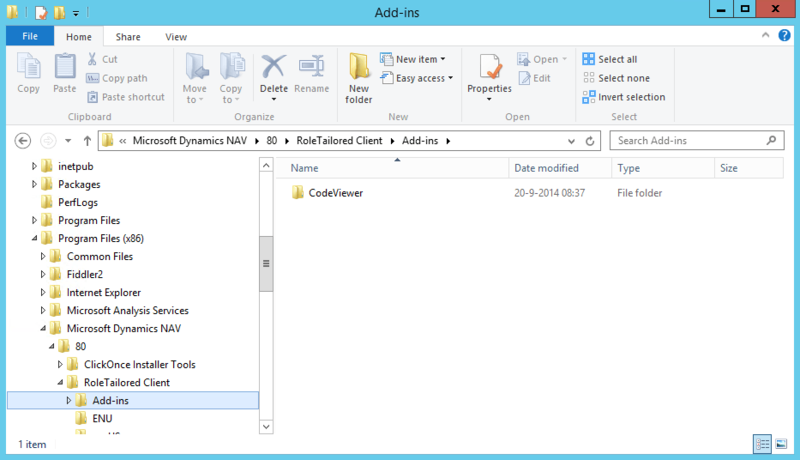 Install the assemblies to the Add-ins folder of the Dynamics NAV server. Usually this is C:\Program Files\Microsoft Dynamics NAV\80\Service\Add-ins. Declare a variable of type DotNet and set the RunOnClient property to Yes, or set the ControlAddIn property of a control on a Page. Look in the Add-ins folder of the Windows Client for the assembly. If not found, the Windows Client requests the assembly from the Dynamics NAV server and copy it in a subfolder of the %TEMP%\Microsoft Dynamics NAV\Add-Ins folder on the client computer. If the Dynamics NAV server cannot find the required assembly the code will fail and an error occurs. Does this break the possibility to combine multiple control add-ins in one assembly? No, that is still possible. You could use a dummy (invisible) control with the correct assembly name to download it or declare a client-side DotNet variable that references the same assembly as the control add-in to force the download. Assemblies can be dependent of other files or reference other assemblies. The Windows Client will download the full content of the folder where the assembly is found. As a best practice, create a subfolder for each component and copy all needed files to this folder. The size of any file cannot exceed the Max Upload Size setting in the Dynamics NAV server configuration. The file name of assemblies must comply with the Prohibited File Types setting in the Dynamics NAV server configuration. A Windows Client that is deployed as ClickOnce Client will follow exactly the same flow. Which is great of course! Some words about the Development Environment. Add-ins must be available locally, otherwise you cannot compile your objects. The Development Environment follows the same flow as the Windows Client. Assemblies are automatically downloaded from the server when needed. The Assembly List, where you can pick the assembly that you want to use in your code, has a new Server tab. So you can browse the assemblies that are available on the server, even when they are not yet available client-side! And you don’t need to set up the server name and port number in the Tools – Options menu, as long as a server instance is selected in the Tools – Database – Information window. Finally, one change with .Net Interoperability that really, really will make many people happy! It has been removed in NAV 2015! 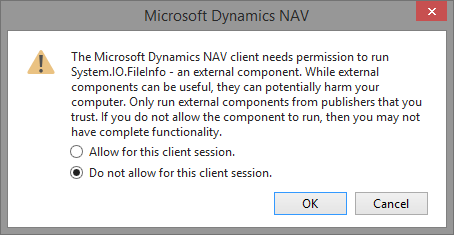 Any chances to get rid of the warning message in NAV 2013/2013 R2? Excellent post. But does it ensure that the I/O calls will be allowed on NAS now ? Earlier up to 2013 R 2, it used to popup error in Job Queue, “Not supported on Dynamics NAV Server”. It’s A Really Great Post. Thank You For Sharing…..